Students - Watching and thinking about animals is funny! Our children use special voices when they imagine what our dogs and cats would say if they could speak English. This poem comes from an old collection about a new baby, and I just found it and cracked right up. Like us, animals have rituals and routines that they follow through their days. A pig belonging to a friend of ours begins each morning at sunrise roaming beneath apple and pear trees. Our dog Eli used to always spend each morning roaming under the high chair. Can you think of any rituals that an animal you know follows? What about you? What do you do again and again, the same way each time? This repeated action might be a neat idea for a poem. 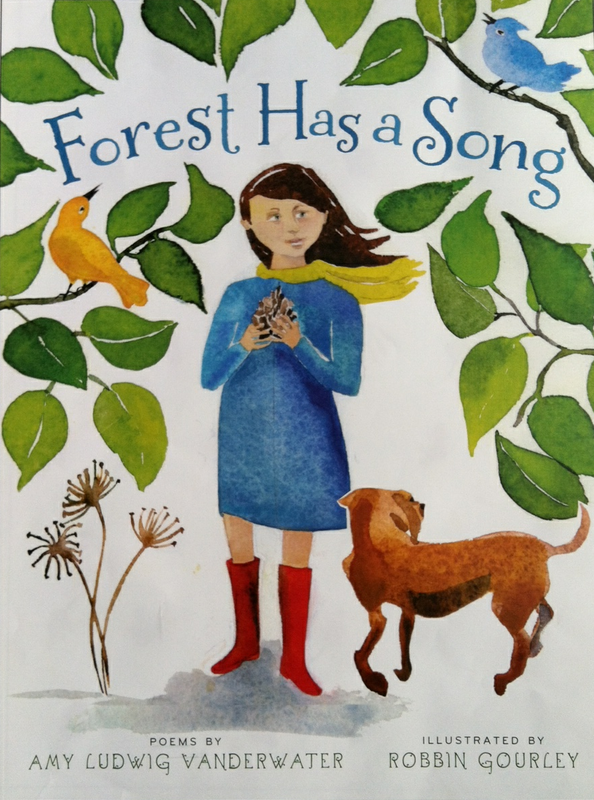 Did you notice how the middle lines of today's poem goes back and forth? I like to do that in a poem when there is movement between two beings or happenings. You might have also noticed that the first two lines and the last two lines rhyme. They're like bookends, tying this whole wee oaty circle poem together. Today's verse is titled after a place, one piece of furniture that we have not had in our home for years. Each place deserves its own poem. Don't you think so? Did you know that Cheerios are the most popular breakfast cereal in the United States? The Cheerios company is 72 years old, and you can find the factory in Buffalo, NY, only about thirty minutes from where we live. If you drive near the Cheerios factory, you can smell Cheerios. Really! (Buffalonians can even wear shirts displaying this fact.) Once, several years ago, the factory donated many old Cheerios boxes to me for a bookmaking project. 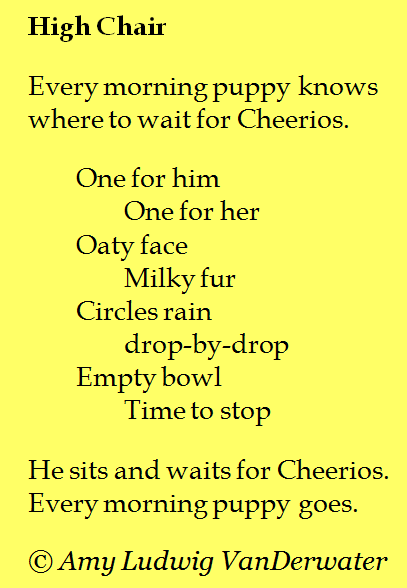 Here is another baby and cereal poem from The Poem Farm archives, titled Baby Cereal. Can you tell that feeding babies was a theme of my life for several years? Would you like to make a guitar or a dollhouse out of a Cheerios box? Well, you can. These instructional videos by Joel Henriques are sponsored by Cheerios, but you could use almost any light cardboard box for the crafts. Joel's blog, made by joel, is full of neat things to make. 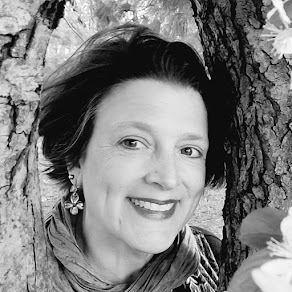 Laura Purdie Salas is hosting this week's Poetry Friday extravaganza over at writing the world for kidshttp://www.laurasalas.com/blog/pf-buckled-bricks/. 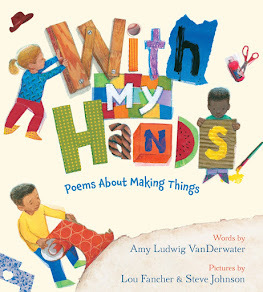 Don't miss the new and old friends and poems! Love it! Our dog does the same! 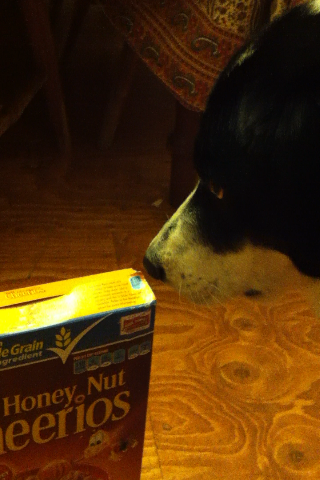 With our dogs, you could replace "Cheerios" with ANY word - food or not - and it would still make sense! So fitting, and it's also anywhere the little ones are with food, not just by the high chair. What fun, Amy! Love! Nice juxtaposition of the two babies! Fun! Our cat hovers by the waffles. I can see this puppy waiting at the high chair--lovely! Great circular motion, Amy. Capt. Jack was very sad when Randy quit eating yogurt for breakfast, because he used to get a little leftover. He would sit by the table and then leap high into the air: "Don't forget to leave me some!" Fun! 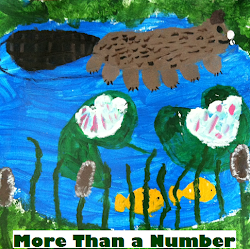 And the writing exercise is perfect for kids to dive into. Thanks, Amy! 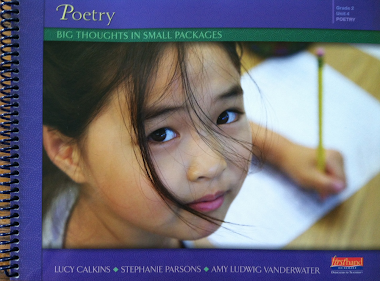 This is a great poem for inference! Oops -- I'm reading with my teacher-brain turned on!! What a fun tribute to our furry family members! They're much more loveable than a Dust Buster. This brings back lovely memories of the days when there was always a sprinkling of Cheerios under the high chair!